Thanks to Javier for shooting these photos at the picklet author workshop at Inspire9. An audience paying attention to picklets. 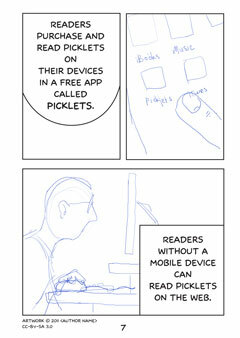 Big thanks to Simon Braunstein for drawing page 3 of ‘Understanding Picklets’. Some other artists have signed up to contribute pages 2 through 6, but plenty more to be drawn. The picklet author workshop on Thursday night went well. For the first time the Picklet Builder site was sufficiently well-behaved that a couple of new authors were able to make draft picklets from their own drawings. Very exciting. Thanks to Matt, Andrew, Al and Javier for participating. Prompted by another artist (Thanks, Simon!) claiming and then quickly working up page 3 in the Understanding Picklets Comic Jam, I’ve drawn the first page. It’s not quite finished but will be the first page of actually-intended-for-publication comic art I’ve drawn. Enjoyed it too. Using Adobe Illustrator, Google Translation Toolkit and some custom XSLT (extensible stylesheet language transformations) I’ve established a workflow for producing translated versions of my mini-comic ‘Understanding Picklets‘.